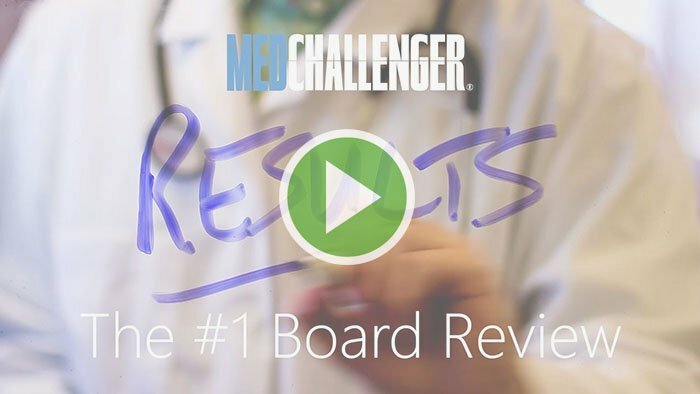 Online board review courses for pass-guaranteed exam prep and MOC & CME requirements for Family Medicine, Emergency Medicine, Internal Medicine, Pediatric Medicine, Pediatric Emergency Medicine, OB GYN, & Urgent Care practitioners & medical residents. With Med-Challenger, you can assemble everything your medical career requires – exam prep & board review, CME & MOC resources, and an adaptive self-assessment system that keeps your practice up-to-date and sharp – in one place so you can “get it done” from anywhere, year in, year out. Nothing beats it. Physician recertification review courses include valuable CME requirements too! Earn AMA & specialty CME credit on your schedule. Varies by product. Save Stress, Time & Money. from anywhere, anytime – every year. Questions? Email sales@chall.com or call 1-800-676-0822. There’s another reason why medical students, residents, physicians, and others use Med-Challenger for their exam review, MOC, and CME credit requirements every year. Do you have a physician training program or group to educate, improve and protect? Try our Group Education Platform. Powerful and cost-saving GROUP medical education systems for physician residencies, staff training and remediation, MOC reliability, and healthcare quality improvement. Call 1-800-676-0822 or email sales@chall.com for a free group program trial or online webinar demonstration.